Thailand's famous soup! 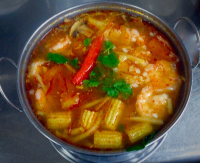 Choice of your favorite, mushroom, bamboo shoots, baby corn, lemongrass, tomato, kaffir lime leaves, chili paste and galangal. 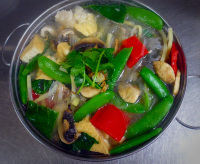 Clear broth soup with choice of your favorite, cellophane noodles, mushroom, bamboo shoots and house's mixed green. Thai's silky, aromatic coconut milk soup. Choice of your favorite, mushroom, bamboo shoots, baby corn, lemongrass, kaffir lime leave, and galangal. All time favorite spicy and sour soups!! A combination for shrimps, squid, green mussels, fish fillet, mushroom, tomato, lemongrass, kaffir lime leaves and galangal. 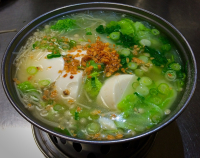 Marinate ground chicken, cabbage, enoki mushroom, glass noodles, soft tofu, green onion and garlic oil in chicken broth.